Apparently Australia, with its relatively small population of around 23 million, leads the world when it comes to veganism. This is what the headlines claimed earlier this year based on Google Trends data. Data that ranked Australia as the number one country for ‘vegan’ searches. Perhaps it’s because Australia is increasingly catering for vegans. Here in Sydney for example there’s a wholefoods cafe (or five) in every suburb. Even more surprisingly one of Sydney’s top pizza restaurants, Gigi Pizzeria, has removed meat and cheese from the menu. Such is the demand that they now offer vegan only pizza toppings. Of course living in Australia myself, surrounded by vegan inspiration, I’ve pondered whether I could happily be vegan. It’s a thought that’s crossed my mind even more so since going almost vegetarian at the start of 2016. My conclusion? For me veganism is a step too far. I don’t doubt the health benefits, indeed I’ve been intrigued to hear about vegan based communities that are known for their extraordinary life expectancies. Rather there are a few things in my diet that I’m simply not willing to give up – in fact I can’t imagine life, without them. Milk, eggs and cheese are at the top of this list. Eggs have been a dietary staple since childhood – when my anti-cooking mother would regularly serve up boiled eggs and ‘soldiers’. For those of you not familiar with ‘soldiers’ it’s simply a term used for toast sliced into sticks. The sticks of toast are dipped into soft boiled eggs. Delicious. Anyway boiled eggs were the one thing my mum did well in the kitchen. They were never so hard that the yolk was firm and never so soft that the white was still raw. It’s a skill that, until last week, I’ve not been able to consistently replicate. Eight times out of 10 my boiled eggs are not quiet up to scratch. This all changed last week thanks to a magazine headline along the lines of ‘how to boil perfectly soft eggs’. Only a handful of attempts later I’ve finally found a foolproof way to get consistently runny eggs. Ok it’s not life a life changing skill but if you share my too hard/too soft disappointments I’m sure you’ll appreciate this simple method. I only recommend using the best quality eggs you can find – for me that means organic or those from my local farmers market. Yes they are more expensive than caged or ‘free range’ labelled eggs but it’s worth it. I’d personally rather eat one egg per serving from a happy hen than two eggs from a stressed hen that’s been kept in a confined space and has been unable to express instinctive hen behaviours. Let me know if you try this method – I hope it works for you! Tags: boil, boiled, cook, egg, eggs, how to, perfect, soft. Bookmark the permalink. Thanks Linda – another fellow dairy lover. Boiling eggs everyday for 9 years – now that’s commitment. With the 9 minute method how long do you boil the water for or do you add the eggs to boiling water and then turn off the heat? Thanks Linda – I’ll have to give that method a go…. The only difficulty with the 9 minute eggs is that if you move to a different range, it may heat slower or faster than your old one. I just discovered that difficulty — my new range heats so much faster so I have to leave my eggs in another 30 seconds to have them come out right. Great tip and useful as I’ll be moving to a new kitchen early next year! There’s no reason to go completely vegan, I feel like as long as you cut down on meats and dairy you’re headed towards the right direction! I’m gonna have to try boiling soft boiled eggs soon, your technique looks great! Thanks Cher and I agree with you – and hopefully this method gives you perfectly cooked soft boiled eggs! Neat post! I have noticed there is an immense amount of paleo and vegan eateries around Canberra, which is perfect for me because they have so much gluten free stuff! I’ve recently been working on hardboiled eggs because of needing them for a lot of main dishes. But I’ll definitely have to try this. I love softboiled eggs with gluten-free toast soldiers too! I have such a hard time with soft boiled but these are perfect! Thanks! Thanks Mollie – I hope you give this method a go – it really does work well! 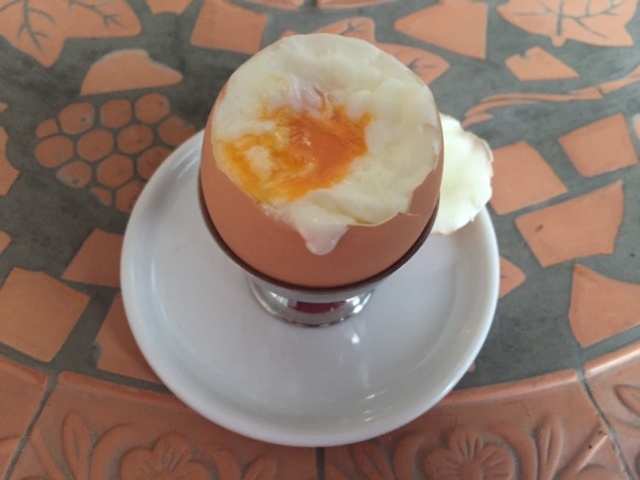 Couldn’t agree more – you can’t beat a soft boiled egg – I hope this 6 minute trick works for you Petra! I will let you know! 🙂 Have a great week ahead!